Every place he’s lived, there has always been one constant in Joe Jennings’ life: farming. Today that farming takes place on 8.5 acres in Kansas City, Kansas; only about fifteen minutes from downtown, J-14 Agricultural Enterprises seems a world apart. The acreage produces everything from beans to broccoli, garlic to onions, strawberries, apples, pears, plums, and peaches. There are often animals, such as rabbits and pigs – although Joe plans on getting rid of the latter, clearing out the pigpen space, and planting more greens. Within a week of moving to Kansas, Joe’s had a one acre farm. When he originally bought his current location in 1997, he planned on using the land to build houses but, because of problems with the city, he instead decided to turn it into a farm. You might think that 8.5 acres would be plenty to take care of; but, since 1994 Joe also has owned a 211 acre farm in Texas where he has 75 head of cattle. Since 2000, Joe has run J-14 as a you pick CSA operation, which means after paying the subscription fee ($300 for 2009) and getting a key to his gate, you can go in whenever you want and pick as much as you want – up to 500 pounds! As Joe’s quick to point out, that’s a much better deal than you’d find in any grocery store. And he’s right; recent comparisons point to CSAs as better choices financially (and for other reasons, too). At peak production, Joe can feed 150 families, but he always ends up with a lot extra. That extra gets turned into “love packages” that he takes to elderly members of the community. He tells of going into area nursing homes, finding the oldest residents, and presenting them with his homegrown produce. During the summer, Joe helps teens – or rather they help each other. Groups of Youth Volunteer Corps members can be found working the fields and, while this helps J-14, it also helps the volunteers. Studies have shown that youth who volunteer are more likely to also volunteer as adults, as well as to donate. Youth volunteers also are less likely to choose unhealthy lifestyles, tend to have greater self-esteem, and tend to have a more positive attitude than non-volunteers. This season, I’m a CSA newbie. Oh, don’t get me wrong, I’d heard the wonders of having fresh produce at your doorstep throughout the summer, but this spring, for the first time, I am a participant. Over the last few years I’ve tried to be more conscientious of my food’s origin, trying to buy local and frequenting farmer’s markets as often as possible. I’ve also tried my own hand at growing herbs, tomatoes, and peppers, with very little in the way of success. And it is for people like myself, with black thumbs when it comes to food plants, and others, who have neither the time, money, nor inclination to garden or who have few choices when it comes to fresh produce, that urban agriculture is a boon. Working with KCCUA, I have learned more about this growing facet of food production. Whether the gardens are you pick operations, sell through farmer’s markets, sell to restaurants, or give their produce to food pantries, urban farmers provide a wide variety of options in areas that are often quite far from any food production. Reading the various farmer profiles, it struck me how often children and/or education is key to these farms. Not only do youth help on some farms, but the farms reconnect them to food — to the realization that peaches come from trees not tins and carrots grow underground. That feels the most heartening, not only because it is positive for the youths but also because it just may be very positive for society and for the planet. In the present economy, it seems impossible that urban ag will do anything but grow, especially as it gets more publicity and has a growing support network, like that given by KCCUA. So, while I enjoy my CSA produce this spring, I’ll do so with a greater knowledge of local, small farmers, and with the knowledge that others in more urban areas will have the same opportunity. While food production is an important aspect, it is also important to keep in mind the other aspects of maintaining a sustainable lifestyle in today’s society. For example, even if that onion was farmed organically by a farmer, say, 20 miles from you, what was it’s environmental impact? True, produce grown under the above conditions do not have the same impact as produce grown across the country (even if grown organically). The impact is even worse when you turn to meat production. The true cost might shock you. Judy Wicks points out that another important facet of living sustainably is the human facet. Did the workers/producers get fair, living wage for their product? Or were they treated little better than drones? As Wicks points out, looking for products that have been fair trade certified helps create a strong and stable community. By this point, you may be thinking, “My god! I’m hungry! I just want to eat!” And it is true that, with so much to think about, organic, sustainable, fair trade, humane, etc, it may seem just too daunting; it’s much easier to not think about our meal’s pedigree. But, our current, mainstream food lifestyle is not sustainable and we are already feeling the impact (e.g. global warming, health problems, etc). So, while it may be easier to close our eyes now, it will only be harder to explain to the next generation why we did not try to better their environment, why you just had to have that out of season, conventionally grown kiwi. I have a new hero. Granted, I’ve added him to my list of 18.5 other heroes, but he has inspired me nonetheless. Reader, meet Daniel Dermitzel. After a stint in broadcast journalism and a bit of world traveling, Dermitzel decided he was tired of reporting on how the world was changing. He decided to start doing his part to change the world. Dermitzel became a part of the David that is battling the Goliath that is giant multinational food corporations. 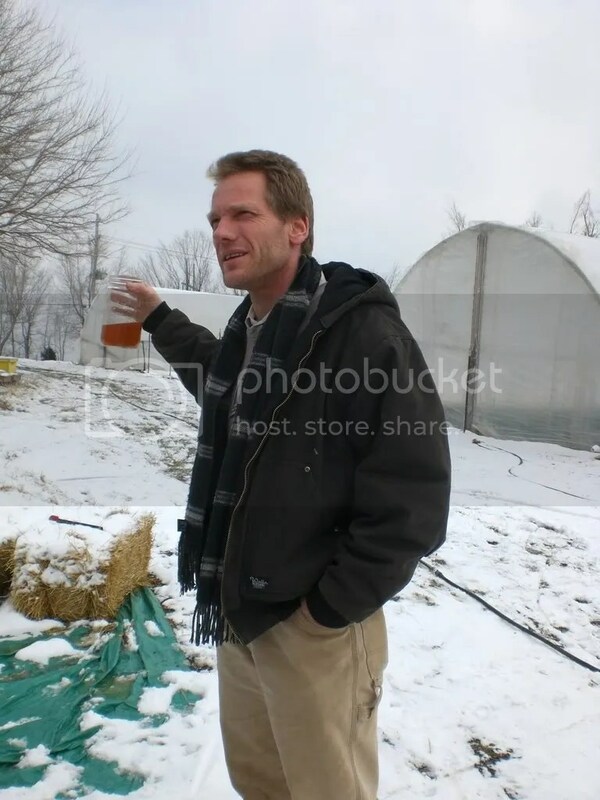 He started at Trailside Farm, an organic vegetable farm in Calhoun, Mo. Dermitzel had no previous experience in farming, but he stuck with it and taught himself. Years later, he co-founded Kansas City Center for Urban Agriculture (KCCUA), where he is now the associate director. Demitzel and his organization grow things. They grow a lot of things– especially considering it is all done on a 2-acre farm. They have grown about 40 different vegetables and numerous herbs. The KCCUA sells most of their produce through a community-supported agriculture program (CSA). CSA members pay a fee and in return they receive weekly bundles of vegetables and herbs for 21 weeks. The KCCUA also sells their produce at local farmers’ markets. But the KCCUA doesn’t just grow- they teach the gospel of sustainability, they spread the word of urban agriculture! KCCUA has multiple programs that reach out to the community and promote community farming and sustainability. I got a chance to participate in the inner-workings of KCCUA. It was a particularly cold day and the farmers were getting ready for an evening freeze. I, a mere visitor on a field trip, was enlisted to help. I got dirty, I got sweaty, and I nearly ruined my kicks. But it was a grand old time. I got was able to bond with the soil and some of the people who grow the food. I saw, smelt and felt how absolutely natural of an environment that this food was growing in. I now have a new appreciation for organic food and the work that these farmers put into feeding their community. Now, I realize that if I buy a Dole organic banana, I can go online and see the farm from whence it came. Whoopdeedoo. That doesn’t compare to actually seeing, smelling, and laboring on the land where your food was created. So I have a proposal for you, reader. And if you aren’t or aren’t able to go to a farmers market. If you don’t care to see where your veggies come from, you should at least meet the people who grew your food.